Industrial Warehouse Fans | ACE Industrial Equipment, Inc. In the summer months warehouses can reach temperatures that can easily cause heat stroke, lethargy or even death. 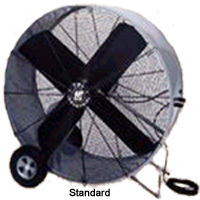 Industrial warehouse fans are a great way to keep the air circulating through your warehouse and keep employee accidents down. Call 1-800-300-6034 Now To Order or for more information on all of our industrial fans.